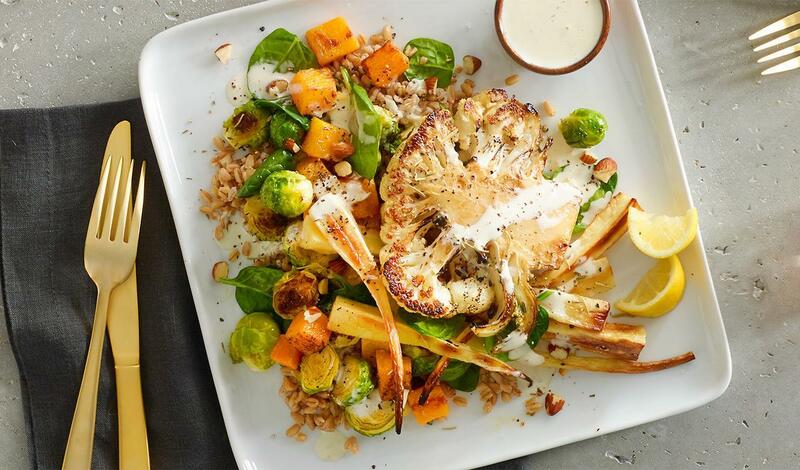 A hearty salad that would serve as a meal combines farro, roasted Brussels sprouts and parsnip with a grilled cauliflower steak and toasted almonds. In a sauté pan warm the farro, Brussels sprouts, butternut squash, parsnips and spinach until warmed through and spinach is beginning to wilt. Add salt, pepper, Herbs de Provence, and lemon juice to taste. Plate the farro mixture, top with cauliflower, drizzle theCreamy Horseradish Caesar Dressing and garnish with almonds.